Dr Johannes Theodorus van der Kemp was the second son of Cornelius van der Kemp, Rotterdam's leading reformed clergyman, and Anna Maria van Teylingen. Johannes was born on 17 May 1747 in Rotterdam, Holland and died on 15 December 1811 in Cape Town. He attended the Latin schools of Rotterdam and Dordrecht. He subsequently enrolled at the University of Leiden in 1763 where he studied medicine, but when his elder brother Didericus was appointed as professor of church history he abandoned his studies. Johannes joined the dragoon guards and fathered an illegitimate child, Johanna (‘Antje’), whom he brought up himself. In 1778 he fell in love with Christina (‘Stijntje’) Frank (d. 1791). He lived with her for a year before being reprimanded by the Prince of Orance on this irregular state of affairs. As a result he both married Stijntje, on 29 May 1779, and quit the army. Returning to his medical studies again, this in Edinburgh, he completed his Medical Doctorate within two years. He also prepared for publication a treatise in Latin on cosmology, entitled Parmenides which was published in 1781. He returned to the Netherlands, where he practised as a doctor first in Middelburg and then near Dordrecht. On 27 June 1791, his wife and daughter Antje were drowned in a yachting accident from which he only just escaped. As a result of this incident he experienced an emotional conversion back to the reformed Christianity of his family. After making contact with the Society he helped found the Dutch version Nederlandsche Zendinggenootschap. 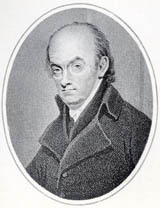 He was ordained in London in November 1798 and began recruiting men for the society. He sailed from London in December 1798 as one of the first three agents sent by the society to Cape, arriving in March 1799. Whilst there he set up the first mission press and in 1799 printed the first work in book-form in South Africa, which was an 8-page translation into Dutch of the London Missionary Society's letter to the inhabitants of the Cape. He then went into Kaffirland to work among the Xhosa people at Ngqika's Great Place (near present day King William's Town). On 21 September 1799 Johannes met Coenraad and very quickly became good friends at Ngqika's Great Place. Dr Johannes Van Der Kemp was the first missionary to cross the Fish River. From the Xhosa he received the name Jank' hanna (‘the bald man’). Van Der Kemp refused to wear shoes or a hat. This was quite odd in the day because these offered protection from the harsh environment. The age difference between Johannes and Coenraad was about the same as that between Coenraad and Ngqika. It was during this time that Coenraad was offered a pardon by George Dundas (which was done to persuade Coenraad to move away from, and therefore stop influencing, Ngqika). Coenraad turned the offer down. On Christmas day in 1799 Ngqika asked Johannes to pray to his God for rain, which the doctor did. A few hours later it began to rain, breaking a severe drought. Ngqika was impressed. Coenraad immediately seized the opportunity and demanded several head of cattle from Ngqika for introducing Van Der Kemp to Ngqika. On 31 Dec 1801 Coenraad Van Der Kemp, 5 English deserters, 4 other burghers and all Coenraad's wives, concubines and their children left the Great Place under the pretence of going to hunt elephants. They were attacked several times by bushmen and this was when Coenraad saved Van Der Kemp's life. In May 1801 they arrived in Graaff-Reinet where Van Der Kemp remained to work amongst the many Khoi-koi and Hottentots assembled there. Coenraad returned to Ngqika's Great Place to repair his relationship with Ngqika around the second half of 1802. Before Coenraad left Johannes gave Coenraad a tortoise shell and silver bible which Coenraad promised to read the bible to his family daily. In 1803 he established a mission settlement for vagrant Hottentots at Bethelsdorp where local farmers accused him of harboring lawless elements. He countered with a list of alleged ill-treatment of the Hottentots by local farmers, but the evidence proved unsatisfactory and the farmers were acquitted. On 7 April 1806 he married Sara Janse, a freed slave 45 years his junior, and had four children with her. This situation and his attitudes caused great opposition from within the colony, and he was for a time ordered by the government to leave Bethelsdorp. Armed with a background in European and classical philology, he pioneered in the study of Xhosa and Khoikhoi languages. Together with his marriage, van der Kemp's attitudes caused great opposition from within the colony, and he was for a time ordered by the government to leave Bethelsdorp. He died a few years later, in Cape Town, on 18 December 1811, of fever, and was survived by his widow.